Emboss resist is a really cool technique which, I thought, looked fab using Close as a Memory. Fortunately, I don’t have anyone to give this card to yet. I made it for a technique workshop the other night. I stamped the flowers in Versamark, then embossed it with white embossing powder. After that, I sponged Kiwi Kiss ink over the image … and then polished it off with a tissue. Using my double-rectangle punch, I added the Kiwi Kiss/Very Vanilla satin ribbon which coordinates with the Kiwi Kiss paper I’ve used. 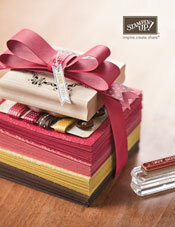 The latest issue of Impressions (for Stampin’ Up! demos) has this really cool technique … embossing on Designer Series Paper. I have changed the colour combo, slightly, from that in Impressions, but otherwise this is a cased card! This card is made with the stamp set Baroque Motifs. I’ve stamped the big swirly stamp in Versamark and then embossed it with white powder on the DSP from the Simply Scrappin Kit, Sweet Slumber. The flowers are stamped in Tangerine Tango and cut out, and the cherish is stamped in Chocolate Chip. Don’t forget, hurry if you want to take advantage of this month’s special – buy three packs of select Designer Series Paper and get one FREE (details here) – you have until Sunday night to place and pay for your order, so don’t miss out, do it now! Last weekend my Dad came to Sydney, visiting the kids, but also to go to an 80th birthday for an old work friend from his Canberra Times days. While we were out shopping at Rouse Hill Town Centre, he asked me were he could buy a birthday card … LOL!! I said I could make one! Using the colours Kiwi Kiss and Basic Black … I embossed the damask image with black powder and then stamped it off in Kiwi Kiss. Then I embossed the “Happy Birthday” from the Level 2 Hostess set, Occasions for All, and the “80” from Best Friends Numbers (retired). I wasn’t very happy with my “80” … it’s a bit crooked! Oh well, it is handmade!! A little bit of Kiwi Kiss/Very Vanilla satin ribbon finished it off. Last weekend we were in Canberra for my sister’s 30th birthday … animal print theme! It was a fantastic party, awesome night (except poor Cath lost her voice) .. and the kids were even good even though it was a late night! It was an entirely unexpected card, nothing like I had in my head to start with … all I knew was that I wanted a card using my new toy, the Sticky Cut Letters, with Chunky Sprinkles! After that, I stamped Baroque Motifs in versamark and heat embossed it in white … using the emboss resist technique … I then sponged over the white embossing with Pink Pirouette … rubbed off the excess ink with a tissue and then added the gorgeous and coordinating Pink Pirouette ribbon! It really only took about 15 minutes to make … once I stopped looking at the blank white paper!! The papers I’ve used are Pink Pirouette, Riding Hood Red and Whisper White. Lyndal used the background stamp En Francais, stamped in Sahara Sand. Next it was Baroque Motifs, Together Forever and Best Friends Numbers (retired) – all heat embossed using versamark with gold powder. The ribbon is not Stampin’ Up! … it was left over from my wedding invitations! And the paper is Whisper White and Stampin’ Up!’s gorgeous metallic gold! The final touch was three pearls from the Pretties Kit. I’m afraid the photo (in poor light at night) doesn’t do the card total justice. I think Lyndal did a wonderful job … the card IRL is stunning and sure to be appreciated by the golden couple! In April I had a great night out at Jayne Mercer’s house for the Inklings Awards night … and there was lots of laughter, stamping and creating going on 🙂 While there, I saw the best card … I just loved it … it made me have to order Funky Forest so I could recreate it!! (do you know that feeling??!). The card was created by Lin Mei, a very talented member of Jayne’s team. Well, my youngest baby turns 2 on Sunday! And we’re off to Canberra tomorrow for my step-sister’s 30th birthday too! So it’s pretty busy around here at the moment 🙂 So I apologise for the short post!! But the picture is the main thing anyway, isn’t it??!! When I saw that the new catalogue had Letters Sticky Cut in it, I couldn’t wait to buy them! I love glitter and it’s a really cool way to bling a card! So, of course, Harry’s card is the first card I played with … a lovely big ‘2’ for him with Chunky Sprinkles 🙂 Plus two gorgeous balloons from Crazy for Cupcakes (thanks, Chele!!) and a cute sentiment from On Your Birthday (thanks again, Chele!!). I coloured the balloons in using my blender pens in Pacific Point, the same colour as the card base, which has been layered on Basic Grey.